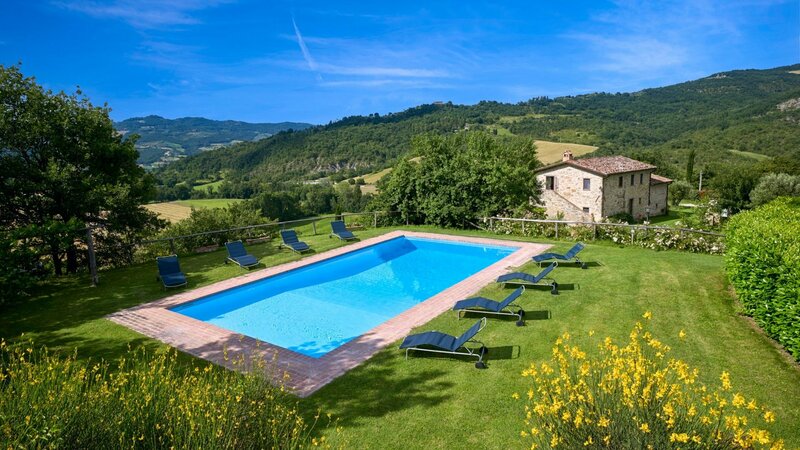 Arcelle is a lovely stone-built farmhouse with an attached guest house, set in the enchanting Umbrian countryside. 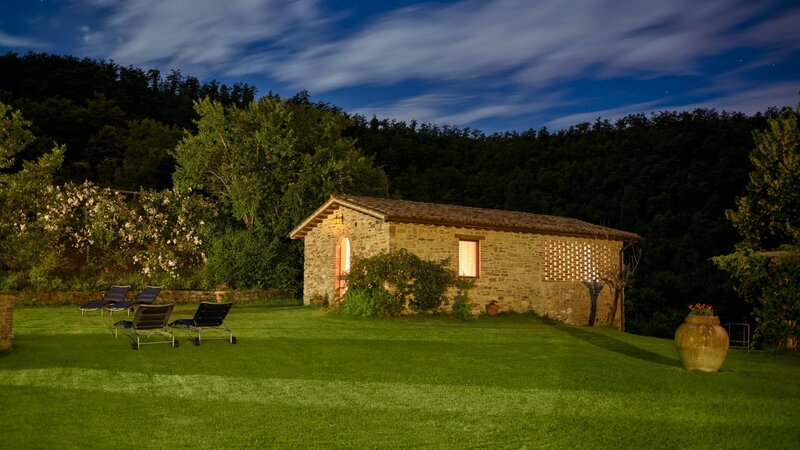 It is within easy reach of the town of Umbertide and the Tuscan border. 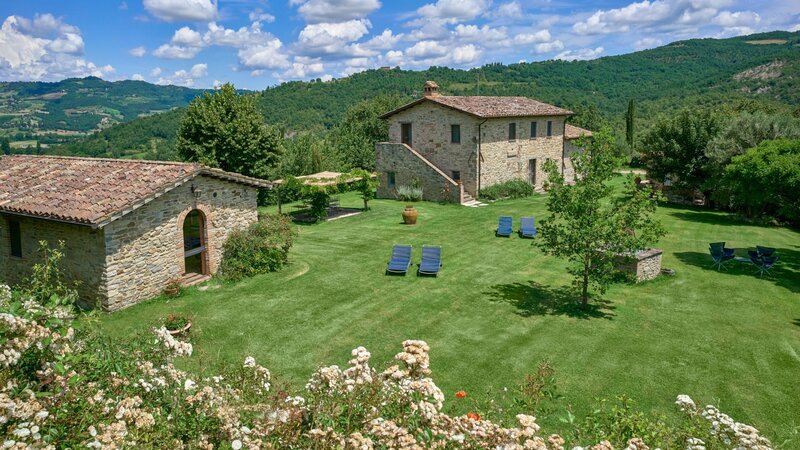 It is the perfect location from which to explore the area, famed for its cultural and historical attractions such as the towns of Siena, Cortona and Gubbio. Between the two buildings is a pergola, which is equipped for dining ‘al fresco’ while you enjoy the panorama. 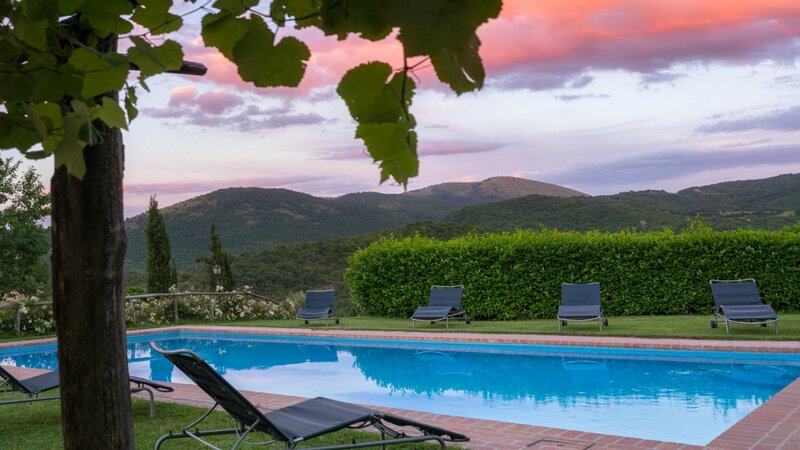 The villa has a private swimming pool set on a raised terrace in the large garden and enjoys stunning views of the rolling Umbrian hills. There is ample comfortable garden and pool furniture available. 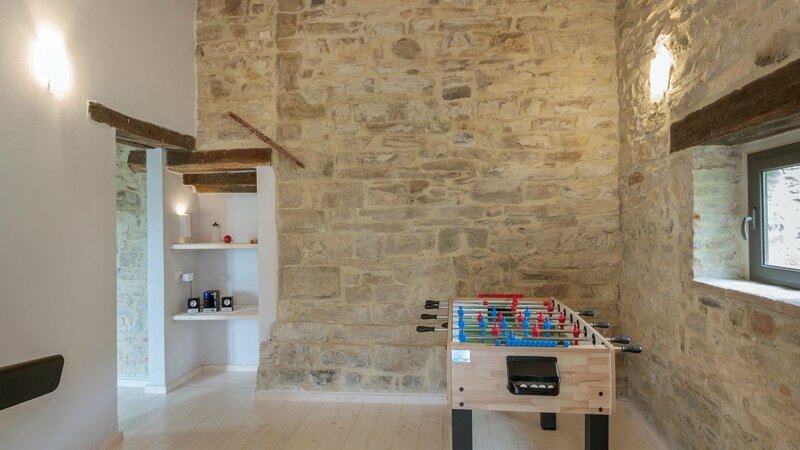 This villa has been recently renovated both inside and out, building onto the original medieval walls in order to expose their beauty and give the house a rustic and authentic feel. The spacious interior has been lovingly restored using 19th Century oak beams for the ceilings. It also boasts stone fireplaces and old terracotta floors. The little village of Spedalicchio is only 3kms/1,8miles away and has a food shop and coffee bar. For a wider choice of shopping facilities, Umbertide is about 11kms/6,8miles away. open spacious kitchen, cooking island with 4 stools, dining table seats 8 guests and direct access towards outdoor gazebo with couches, spacious living room, guest bathroom with shower (+ extra hand held shower). 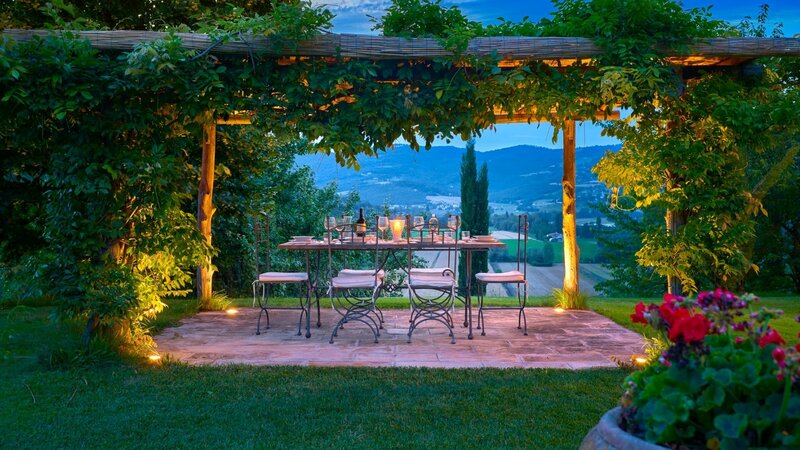 Outdoor; second gazebo with dining table for 10 guests. bedroom 1: twin bedroom (convertible into a double) with A/C and en suite bathroom with shower cabin (+ extra hand held shower). bedroom 2: master bedroom with A/C and spacious en suite bathroom with shower (+ extra hand held shower). bedroom 3: double bedroom with A/C and en suite bathroom with shower (+ extra hand held shower). few steps leading down to a lower level. bedroom 4: double bedroom with A/C and en suite bathroom with bath tub (+ hand held shower). bedroom 5: double bedroom (not convertible into twin) with en suite bathroom with bathtub (+ hand held shower), not equipped with A/C. grocery shops in Spedalicchio 3,3km/2miles, nearest restaurant and wine tasting 2km/1,2miles, shops, restaurants and supermarkets Umbertide 12km/7,5miles, nearest golf course 22km/13miles. pets permitted, gravel road 3km/2miles in good conditions, guest house accessible for wheelchair. 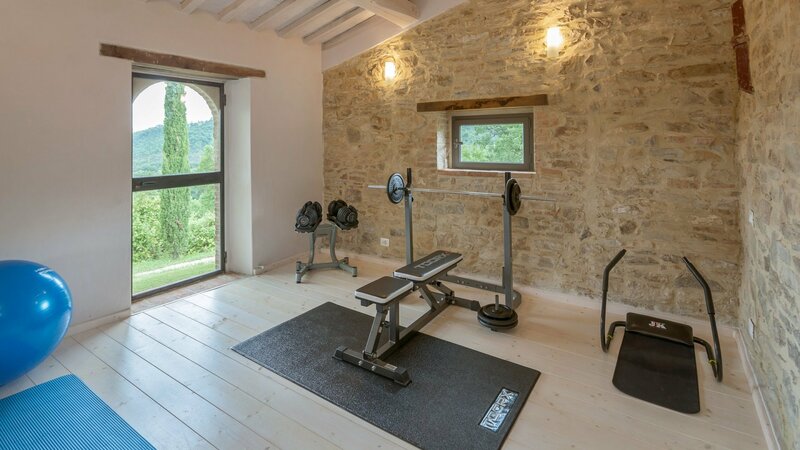 There is a gym on the ground floor of the main villa, access from outdoor. 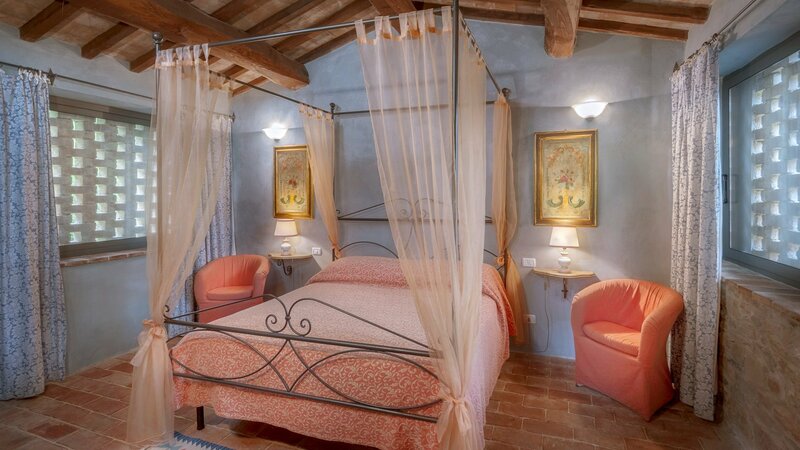 The main villa has a modern interior style while the guest house presents a typical Italian traditional interior. Concierge service, wine tasting, maid service 3 hours once a week (Wednesday), change of linen on Saturday, change of towels on Saturday and midweek, final cleaning on Saturday. heating, cooking service from 15 to 30 Euros per hour (depending on the number of staff members involved) + cost of food, extra maid service 13 Euros per hour, baby sitter 13 Euros per hour, breakfast service 55 Euros + cost of food. Umbertide 11km/7miles, Cortona 29km/18miles, Gubbio 33km/20miles, Lake Trasimeno 34km/21miles, Perugia 48km/30miles, Montepulciano 56Km/38miles, Florence 145km/90miles, Pisa 220km/136miles, Rome City centre 240km/150miles, Siena 105km/65miles. airports: Perugia 31km/19miles, Florence 145km/90miles, Rome 270km/167miles. trains: Perugia 48km/30miles, Umbertide 11km/7miles. 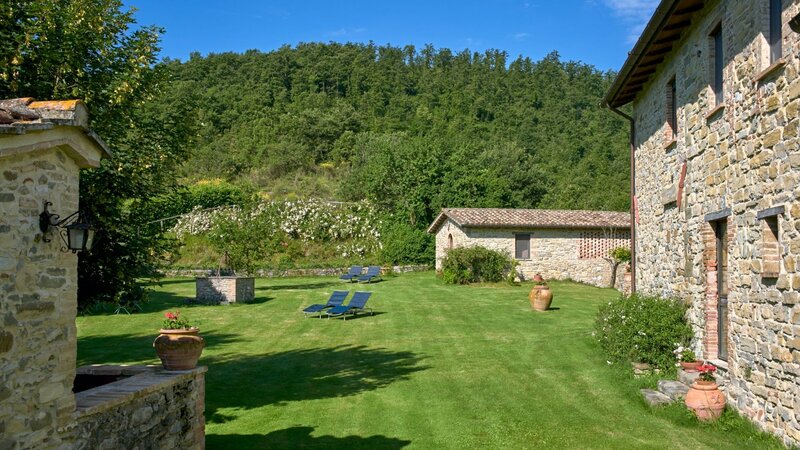 "Villa Arcelle is in a beautiful spot with breathtaking views. 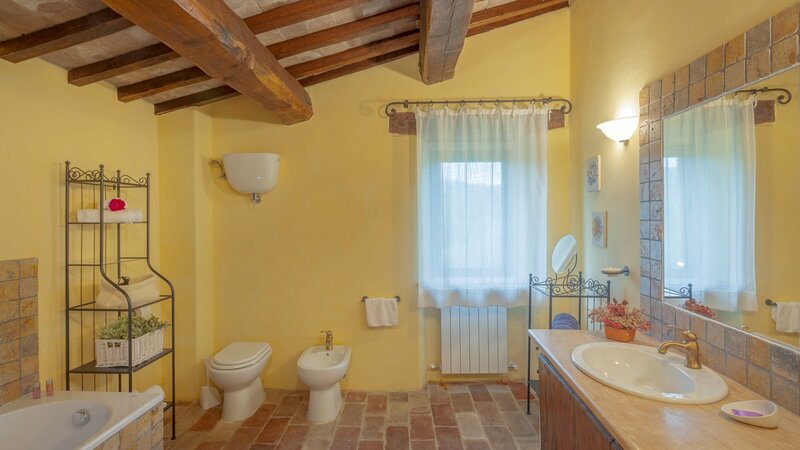 The accommodation is authentic and spacious and the garden and pool area gorgeous, especially the pergola which is covered in Wisteria and is a fantastic place to eat lunch and evening meal. Having a gym was a bonus for our boys and there are some bikes if you have the energy! The Villa is quite a long way off the main road and not well signposted but this isn't really a problem. The Calagrana restaurant is nearby with good food and lovely views. However, our favourite was I Girasoli di Sant 'Andrea in Molino Vitelli where the food is excellent. The restaurant also has a wine tasting experience which is worth doing. The guest house could do with a little updating and the kitchen needs some new equipment." "We had a lovely experience at the farmhouse. The owner was available to help us if we needed it. The concierge helped us tremendously and was always ready to answer questions. " "A positive may be its location if you want to totally unwind, a negative may also be its location which is rather isolated. 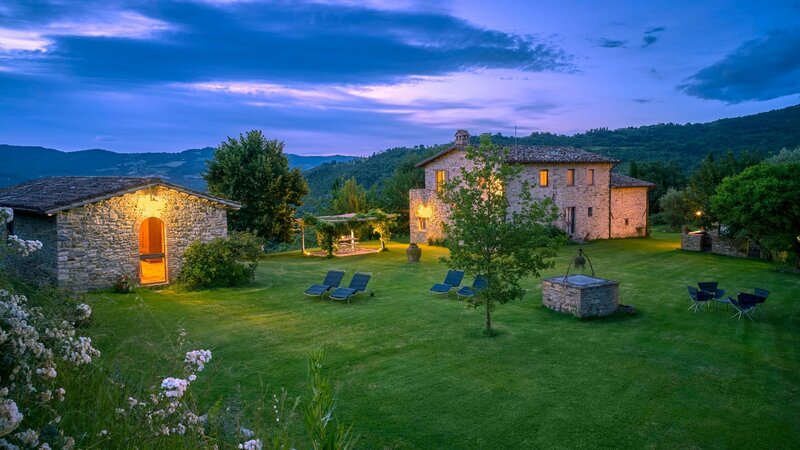 If you are looking to pop round to have an early morning espresso or early evening glass of prosecco with the locals, might not be the perfect choice, but if you want to relax and switch off your mind THIS is the perfect place. Nice pool, good gym, plenty of space. Very helpful local staff though it will help if you have at least some basic knowledge of Italian. I was able to get some recommendation to local restaurants. Go to Montone (about 15kms away) for l'antica osteria. " “Dear Rachele, we are now back in Australia after having a wonderful time in Italy. The first thing I want to do is to thank you for all the help you gave us when we were making the booking and afterwards. I really appreciated your patient, prompt and always helpful replies to my questions. Would you please also thank Chiara for her help when I lost the house information sheet. I would have no hesitation in recommending your agency. I had expected that Arcelle would turn out to be not as good as it looked on your website. In fact it was better. The rooms and the beds were bigger and lighter than I had expected. Although I think you describe the beds as Queen size, by Australian standards they were king size. It was very pleasant to have insect screens on the windows which could then be kept open. The kitchen was quite adequate and there was a generous supply of crockery, cutlery and glassware. The bedrooms were very comfortable and had plenty of storage. The bathrooms were a good size and contained everything required. The house was very clean and the grounds well maintained. Most of the time we ate outside in the shaded eating area from which you have a beautiful view of the Niccone valley. There were plenty of outdoor chairs in the garden and around the pool which also was well maintained and clean. We thought that Arcelle was in a great position. It sits on a rise by itself and there is almost no sound at all at night. The unsealed road leading to the house is a little rough in parts but no more than you would expect of such a road. There are any number of interesting excursions you can make within an hour’s drive and plenty within half an hour’s drive. There is a wide range of restaurants nearby. I would include in your recommendations Ristorante Castagna in Preggio. I noticed only at the end of our holiday that there is a walking track not far away. There is a sign post to it near Niccone and another on the road to Lake Trasimeno. It would be useful to include some information about that in your Villa book. We walked around the unsealed roads which was pleasant but it would be useful to have at least a sketch map of the roads so that one could plan a circuit walk. Roberta who shopped, cooked once, and cleaned was very helpful and efficient. I had only a few very minor criticisms of the house. The television had many channels but basically none in English as far as I could make out. A list of channels and their numbers might help. The bottom rack of the dishwasher has lost one of its rollers and is a bit difficult to pull out and some English instructions about the clothes washer would help. It has a trick which is that the red on light must go off before you can start a new cycle (or something like that). The lounge in the guestroom could be replaced with something a bit more comfortable and there was no hairdryer in the guesthouse bathroom. I think our friend said that there was no electric outlet beside the mirror in the guest house bathroom. The instructions on getting to the house could be improved. Eg. instead of saying drive through Umbertide it would be more helpful to say take the road to Lake Trasimeno at the intersection on the edge of the historic Umbertide city. It would be possible to give better instructions once you get to the white road (there are a number of side roads or driveways going off it) and I think there was no sign at all on the driveway to Arcelle. All of these things were easily overcome and did not detract from the pleasure of being in such a beautiful spot. It may be useful for you to know that we ended up taking the bus from Fiumicino airport to Perugia. The train involves changing trains at least once. We actually had to change buses twice but that just involved one bus pulling up beside our bus on the side of the road and the passengers transferring themselves and their luggage to the new bus. I don’t know if that happens all the time. We hired a car from Perugia, thus avoiding navigating in and out of Rome. I am happy for you to use any of this information on your website." "We had a fantastic time at the Villa. No negative comments at all from me except next time please can you make sure the weather is better! :)"
"Perhaps a little late, but be assured that we had a wonderful time again in Italy. Both villas (La Sommità Cottage and Arcelle) were great and the owners/caretakers were very kind and helpful. It was our second year in Arcelle but we are already considering going back next year. The scenery is simply amazing, the food is the best and the people are lovely." "We had a lovely holiday and Luca was very welcoming and helpful upon our arrival. We loved the location and space at Arcelle. Especially loved the views and the outside dining area and garden. 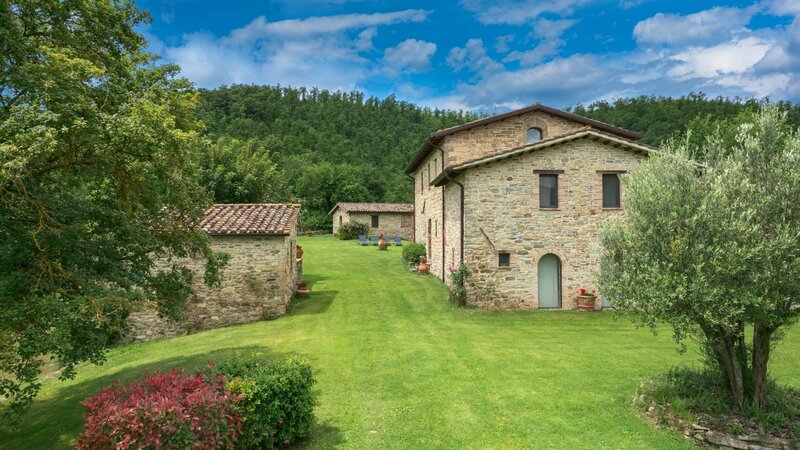 We will certainly be booking through Home in Italy again, this is our second year with you and we have been very pleased with each property."